Telebation is a term coined for a remote intubation with the aid of telemedicine. This was first demonstrated at a small community hospital in Arizona which required an urgent intubation for a patient with severe COPD. The physician on staff was not comfortable with his intubation techniques so he set up a telemedicine conference with the University Medical Center in Tucson. With the use of a video laryngoscope, an attending in Tucson was able to visually assist the intubation and secure the airway before transport to a tertiary care center. The outcome in this situation was favorable, but it raises some troubling questions. First, was the intubating physician ACLS certified? If he was he should have been familiar with the intubation technique. He would also have learned the other modalities of securing an airway, including the use of the Combitube. The Combitube was designed for scenarios exactly like this, when there is a difficult airway or when the user is not experienced with intubations. This small community hospital has the funds for a video laryngoscope and telemedicine equipment; it must or should have other intubation aids available. How long did it take to set up the telemedicine conference call? If this was an emergency intubation, how would the small hospital have dealt with the situation? What would have happened if the remote user lost the airway? 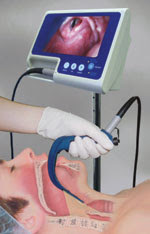 Video laryngoscopy is helpful but it is no panacea. There have been many times where even with the use of video I was only able to get a Grade 3 view, essentially no view of the cords. What would have happened then? Again it goes back to knowing how to use other equipment like the Combitube or the LMA. The use of telemedicine here also promises interesting possibilities. If we can treat a patient remotely by telling somebody else what to do, does that mean anesthesiologists can work from home? Imagine hiring some medical student, or even a premed student to sit in the OR for you. Using telemedicine you can have him intubate the patient for you. You can then electronically monitor the patient's vitals and tell the student what meds to give. At the end of the case the student will show you the train of fours and then you tell him to reverse and extubate the patient while you are sitting at home in your PJ's watching CNBC on your 52 inch LCD. This would be even cheaper for the hospital than hiring a bunch of CRNA's.